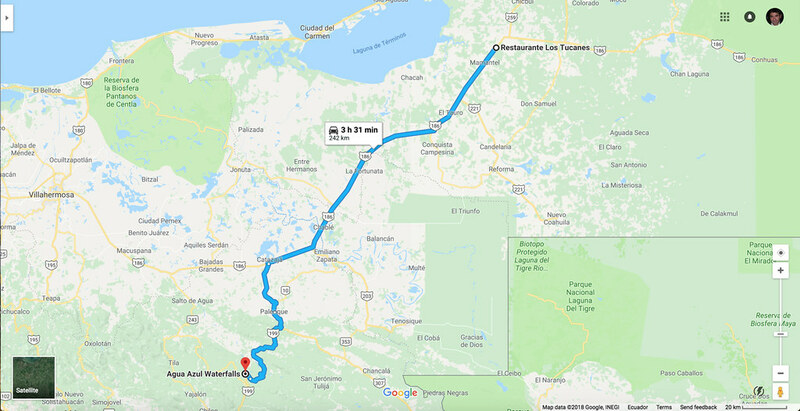 Our drive from Agua Azul to Palenque was long and difficult. But not as difficult as the road to get to the waterfalls, which I see now totally escaped my mind when I published the last blog post. Troubles of waiting a YEAR after you’ve been some place before writing about it! 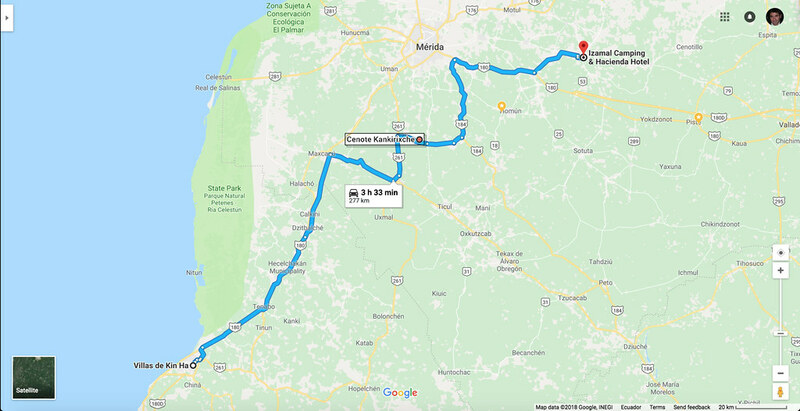 But I’m not going to go back and update that post, so here’s what had happened: the most direct route was closed due to protests and road blockades in Chiapas. 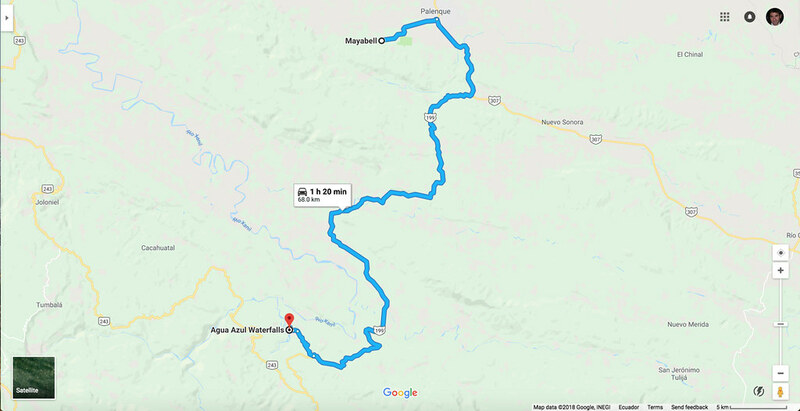 A police presence had set up at a large intersection for the turnoff for Agua Azul and waived select vehicles over, and we were one of the lucky chosen ones. I thought we were going to get hassled for something, but they kindly explained the situation…said the locals are blocking the road ahead, and helped us read maps and find an alternate route. Part of me wanted to just go forward, and hope the blockade was gone by the time we arrived. I also wanted to check off “road block by disfranchised indigenous communities” on our bucket list. But we erred on the side of caution and took the long way around. 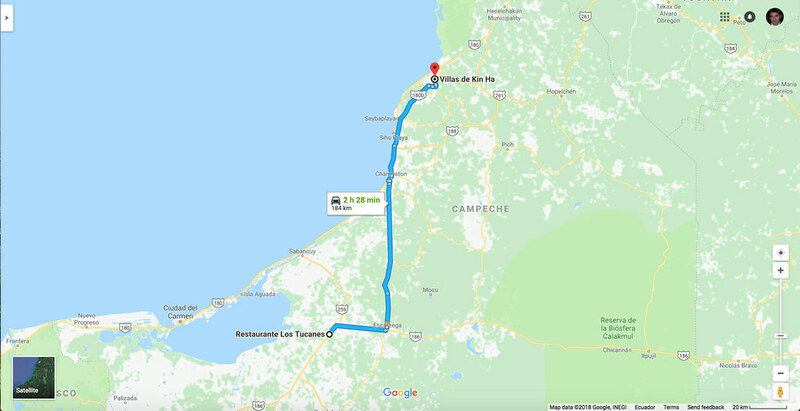 We later discovered (at Palenque) that our friends La Brigade opted to press onward at that intersection, only to be stopped for hours at the blockades, and eventually turned around and took the long route as well. We felt really were lucky to have been one of the vehicles waived over after hearing that! We arrived at Mayabell campground and quickly settled in. 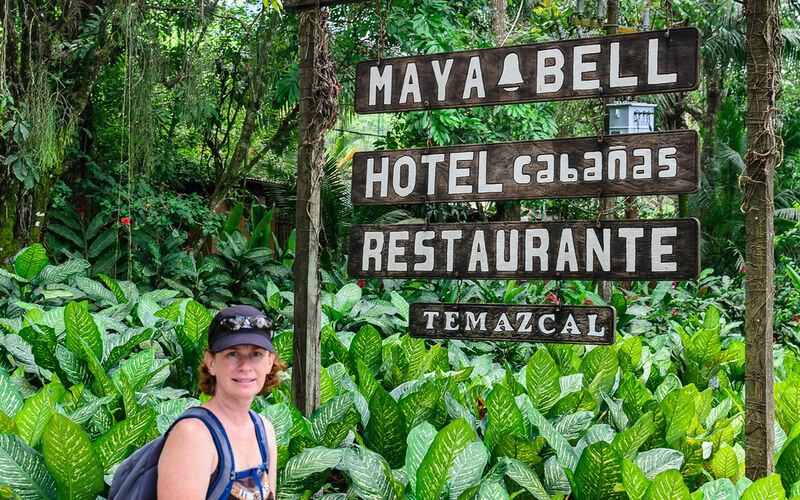 From our introduction to Howler monkeys, the great pool, the amazing ruins of Palanque, and meeting so many wonderful fellow travelers, this was one of our top spots of our travels so far….even a year later. 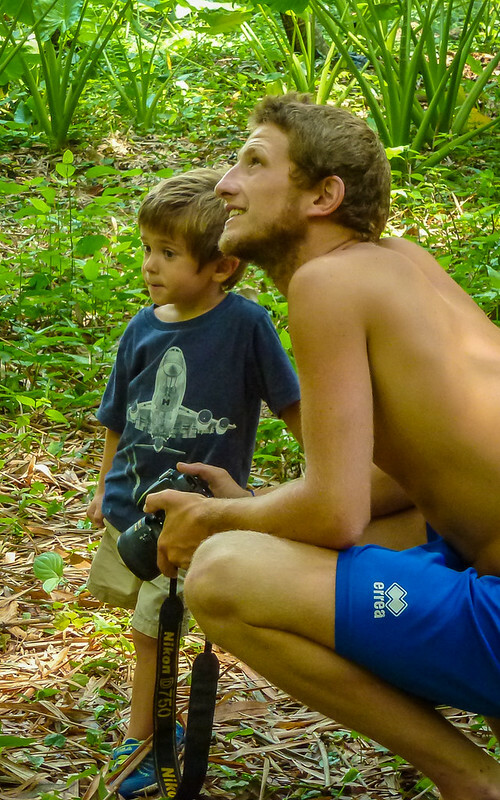 Guido was our first friend here, and promptly warned us about the sound we’d hear in the mornings from the howler monkeys living in the trees above the campsite. 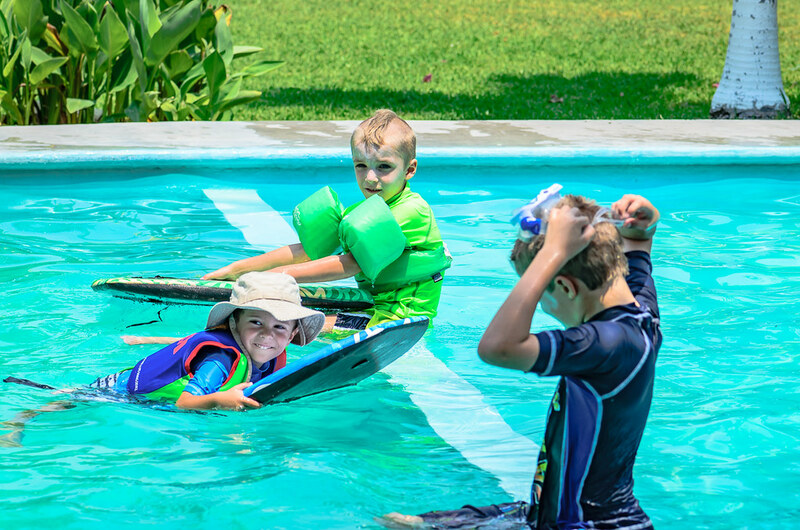 Later at the pool, Indigo adopted Guido as his best friend and usurped most of Guido’s time. Guido had the most amazing patience with Indigo in the pool each and every day we were together. He was a delight to meet, and we hope to cross paths again one day. 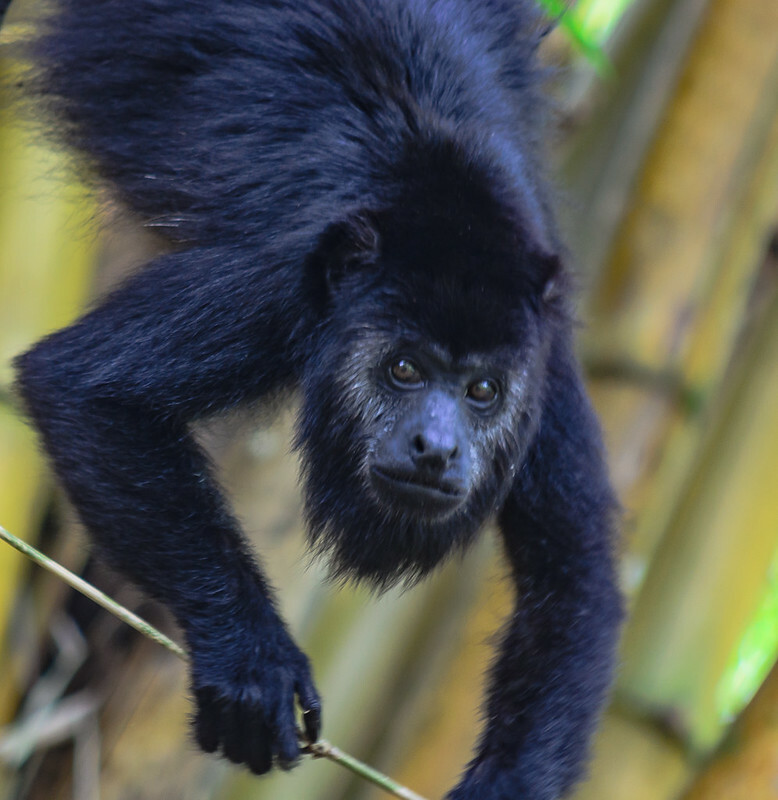 As Guido forewarned, we were introduced to the extremely loud, somewhat creepy howl of the howler monkeys in the morning hours, reigning down from above. It sounded to me like some big cat or bear like animal growling in the jungle. The sound these monkeys make is incredible, and Indigo was afraid to walk around the campground whenever they started up. Seems there were several factions of monkeys living in various trees around the campsite howling to each other, or perhaps at each other. We were happy to see La Brigade roll into the campground as well. 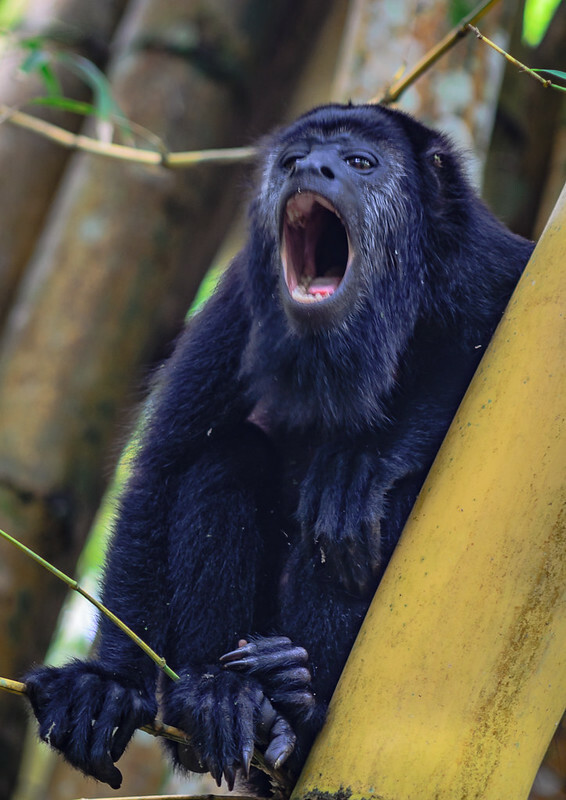 We were able to provide the howler monkey warning to La Brigade (I think once you hear them, you can’t wait to tell the next person about it), and soon after walked together to the large bamboo grove just behind our camper, to watch an entire family climb about the branches. Below is the sound of the Howling Monkeys Okan recorded at the campsite. Would you guess that sound was coming from a relatively small monkey? While we were watching, a baby howler lost his grip and fell at least 20 feet! Our hearts jumped and I had to stop myself from running to the baby to see if it was injured. I was certain the mother above us wouldn’t take kindly to our interference. A cat started approaching the limp baby monkey in the grass, and that’s when I needed to hold Indigo back from his own rescue mission. Indigo knows first hand what damage a feisty cat can do and we were all wondering when the mother would come to the rescue . The mother eventually came down as we gave her space as she collected her baby, who by that time had shaken off the fall. They baby quickly climbed on her back, and to our surprise, once the mama and baby were heading up the tree, the males started peeing at us from above! We decided that was the a good time to leave the howler family alone for some private time. We also met the sporty and speedy (they are already in back in Colorado!) Treschamigos here. We enjoyed drinks in the evening together and lamented about our fitness levels steadily decreasing with the driving, sitting, and drinking….followed by more driving and sitting. It’s really hard to figure out how to fit in an exercise routine when there is no routine in your life, or even just to stay active. This conversation is what I am sure prompted us to walk in the heat of the humid jungle to the ruins the following morning. 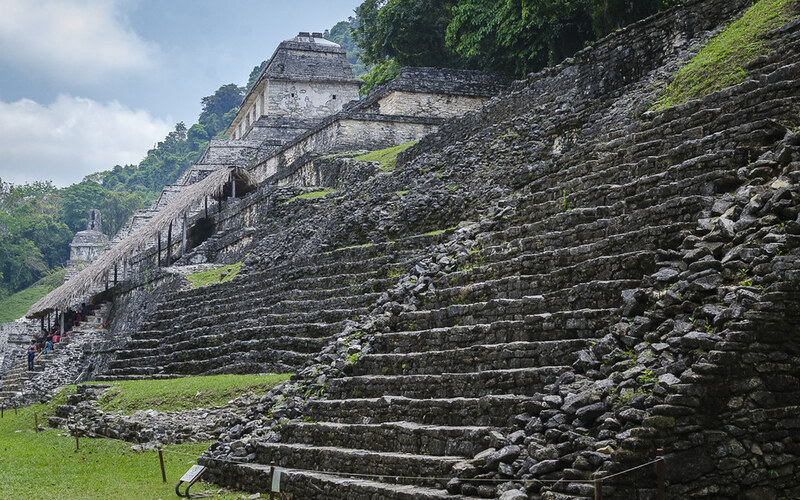 Palenque was definitely the highlight of our stay here. 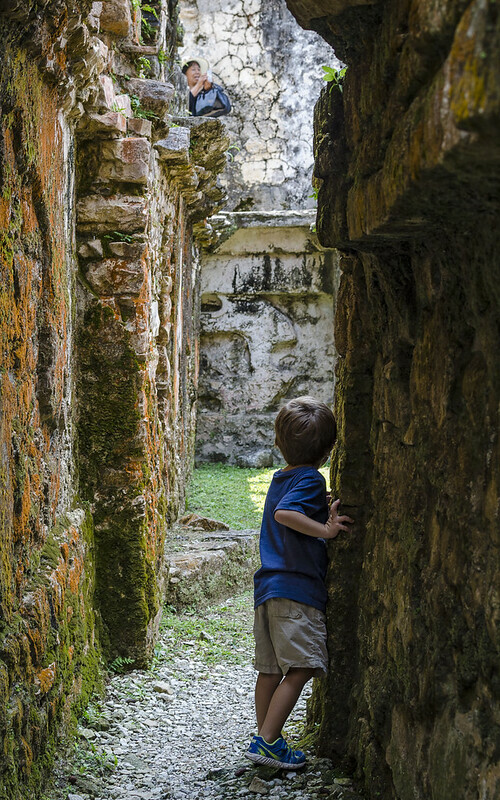 The ruins were magical, as they were nestled in the dense green jungle, and we could walk in and around most every structure. Indigo, who had to be carried by Okan most of the way to the ruins, decided he wasn’t really tired at all, and toured (ran around) the ruins all day. Seeing that we were snapping photos at every turn, he tried his hand at photography and managed to get a decent shot of us in front of the ruins. 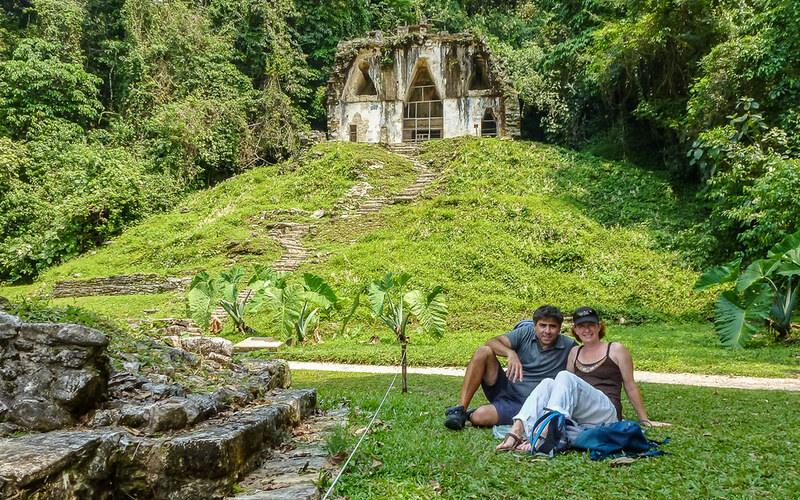 As much as we loved the massive ruins of Teoteahaucan, Palenque became our most favourite Mayan ruins that day. 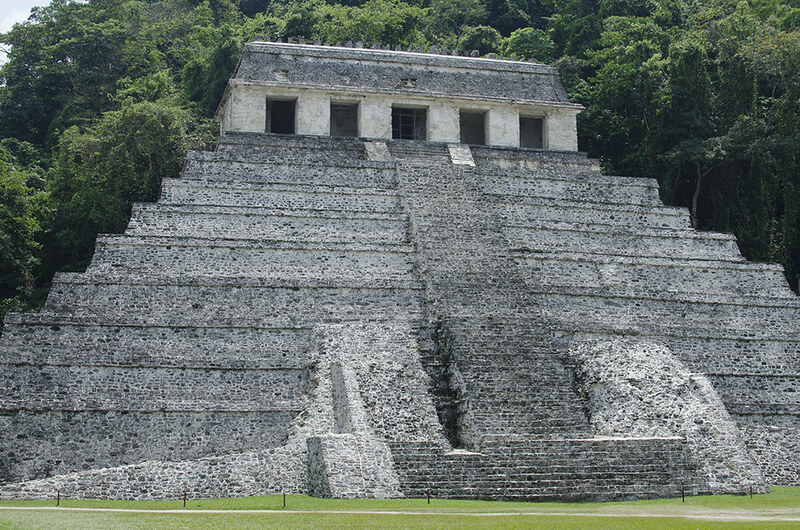 Although most of Palenque has now been charted, not all charted areas have been excavated. 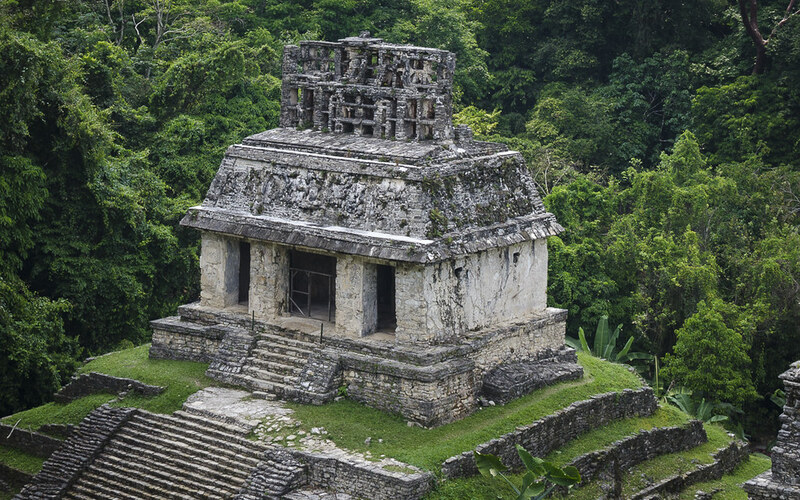 Excavations are invasive and destructive, not to mention really expensive when done in the jungle, as trees keep growing and burying structures each year. 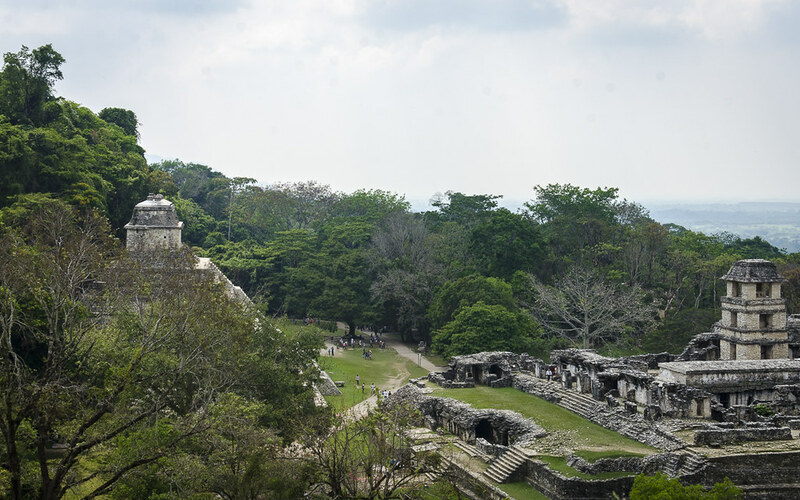 The Maya Mapping Project provides great detail about how much of the city has been revealed. After watching Indigo run about with such enthusiam, and thinking back on the lack of exercising, Okan and I decided to walk back to the campsite as well. Thank goodness it was downhill, and that we had a lovely pool in which to recover. 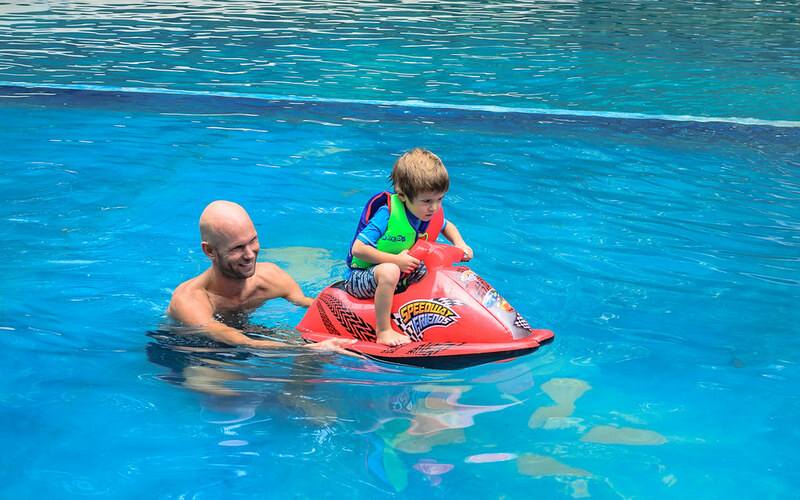 We also opted for a massage here, but after visiting Bali Indonesia and the spas of Ubud, every time we splurge on a massage, it just never lives up to our expectations. Our memories are long, because we haven’t had those massages for 3 years! Perhaps our memories have distorted our perception somewhat? 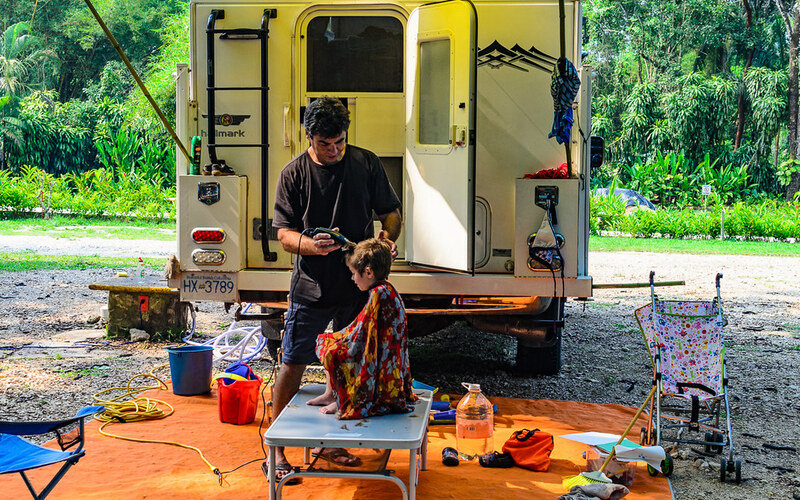 While at Mayabelle, we also took care of regular life…haircut for Indigo and maintenance on the truck. The bamboo awning structure Okan devised in San Cristobal worked well here, and we were happy for the shade, and blocking the falling nuts from the trees above….and possible dissuading more Howler monkeys from peeing on our heads. When Okan and I first met, he told me of things he’d always wanted to see and do. Things that were part of my childhood and I thought very normal. First, run through a corn field (being from Amish country in Pennsylvania…this was very normal for me) and second, see fireflies (also a regular childhood experience for me). I was so happy when night time fell, and the forest lit up with thousands of tiny intermittent yellow glowing fireflies. 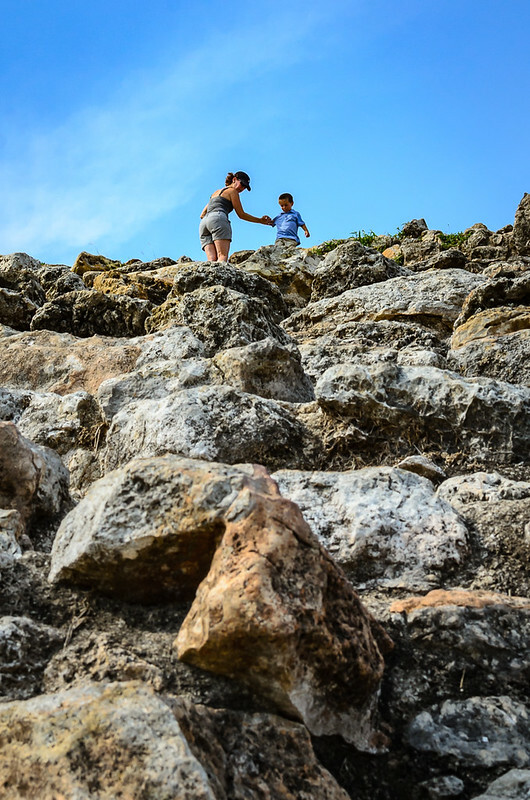 We stared for a long time, and I think it was as cool as Okan had imagined it would be. It was really hard to leave, but leave we did, caravanning with Colleen and Luke of Treschamigos to the next site. 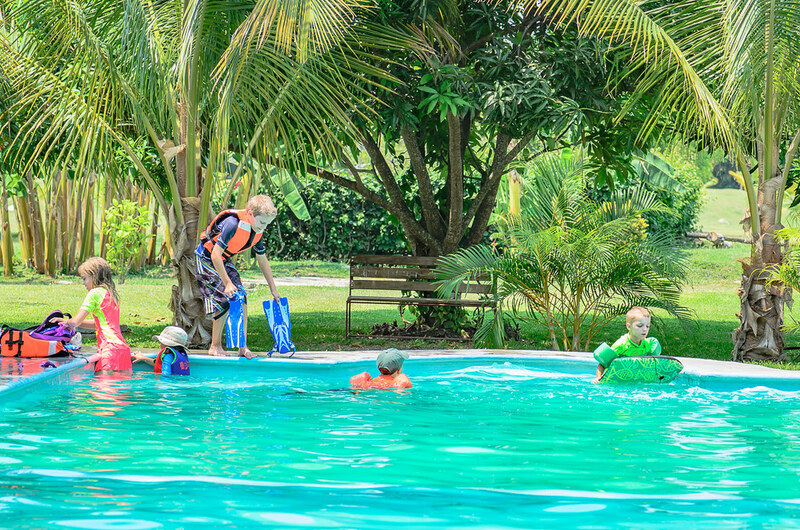 Not a lot of “sites” or “sights” after hours of driving, so along the highway, Restaurante Los Tucanes just outside the tiny town of Nuevo Pital, with its lovely pond, pool, play structures, and a large field did the trick. 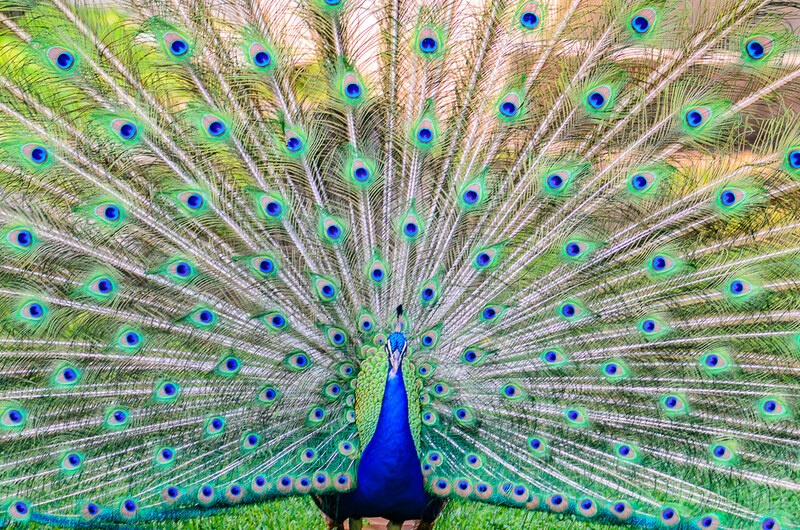 There was a family of peacocks here, and now I honestly don’t know which is louder…a peacock or a howler monkey. Totally different sounds…but both incredibly loud. The peacocks proved to be very domesticated and would eat out of our hands. 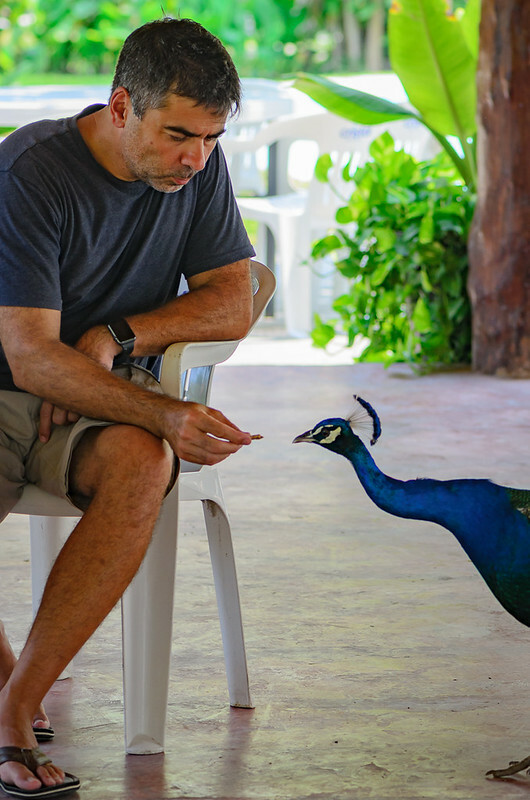 Unlike the aggressive monkeys, they behaved more like dogs begging for food, and we needn’t worry about them trying to pee on us. 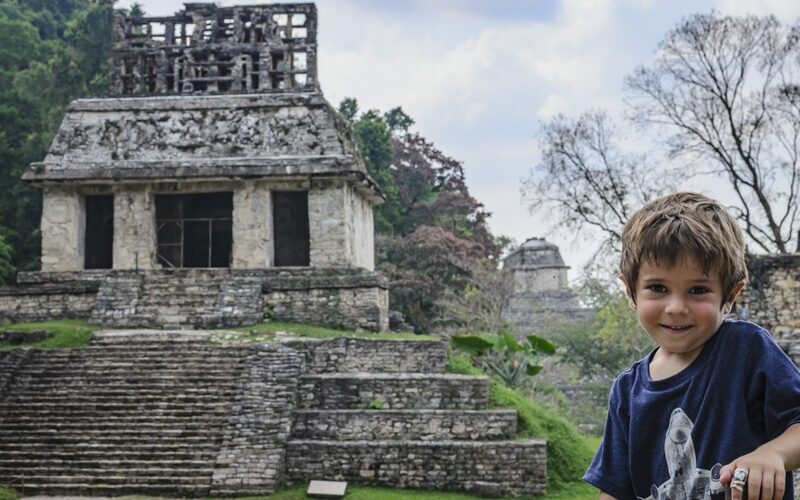 Before our trip began, I found myself researching other families that travel to make sure I wouldn’t be “ruining” Indigo in some way, and came across the Kortman family of Home Along the Way, who travel extensively with their kids. I read so much about them and their life, and low and behold here they were! I always feel a bit strange walking up to people feeling like I know too much about them, and me being a stranger to them. But, they are a warm and welcoming family, and we enjoyed our time getting to know them better. Paul and I geeked out a bit with discussions around engineering and marketing, and I could tell Okan was happy that I found someone who could engage with me on these topics. Paul still works full time while on the road, and runs his business completely remotely. He’s a great resource for anyone looking to travel, work, and provide for a family of 6! We all parted after a couple of days, and although we wanted to caravan more with Luke and Colleen, we’ve not seen them since. We are getting slower and slower in our travels, and cannot keep up with the younger crowd. Even though they returned to Colorado for an extended break, they came back to Mexico and passed us somewhere in Colombia, and made it all the way to Ushuaia, Argentina and returned to USA. 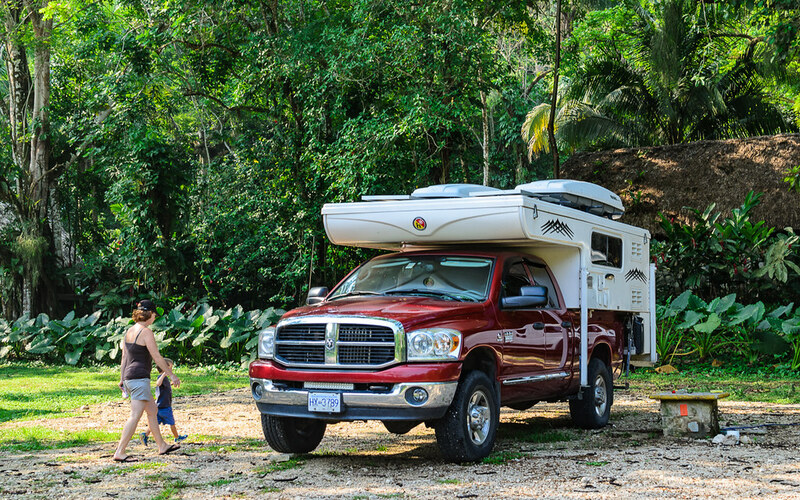 We were at least happy to see their truck, if not them, stored at a campsite in Cancun while they were back in the States. Maybe we’ll see them in Colorado!? 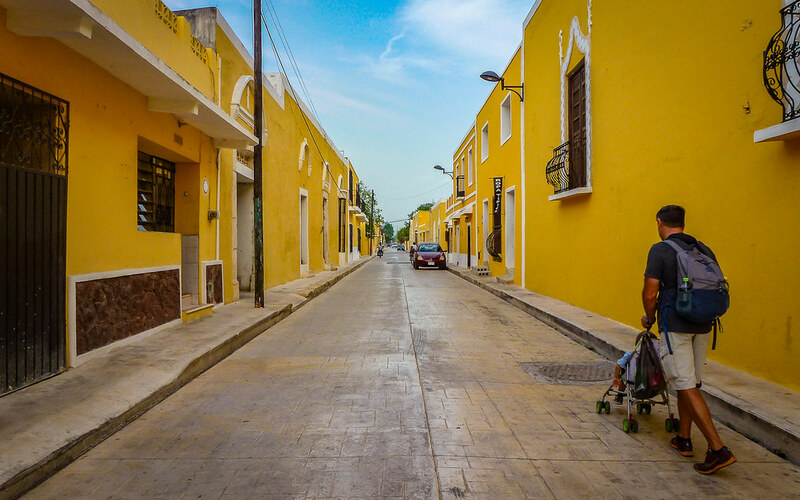 We headed to Campeche next, on our way to Merida. 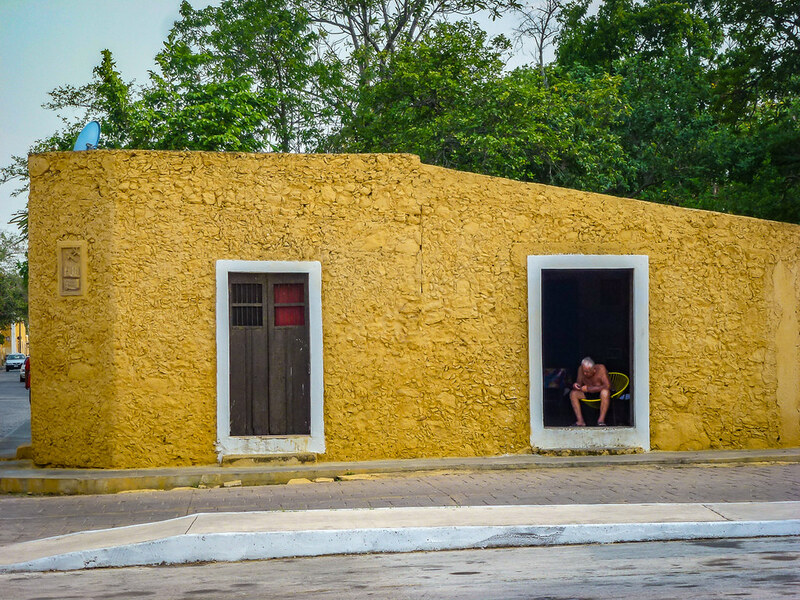 We drove about Campeche looking for a campsite close to town, and only ended up frustrated and irritable. We decided to not bother seeing the town, and ended up staying in a very mosquitoey grass yard of a hotel along the highway outside of Campeche. The camping was devoid of character, and a bit scary as we had to walk by a very aggressive barking guard dog each time we wanted to use the bathroom in the hotel office. We were happy to get out of there. 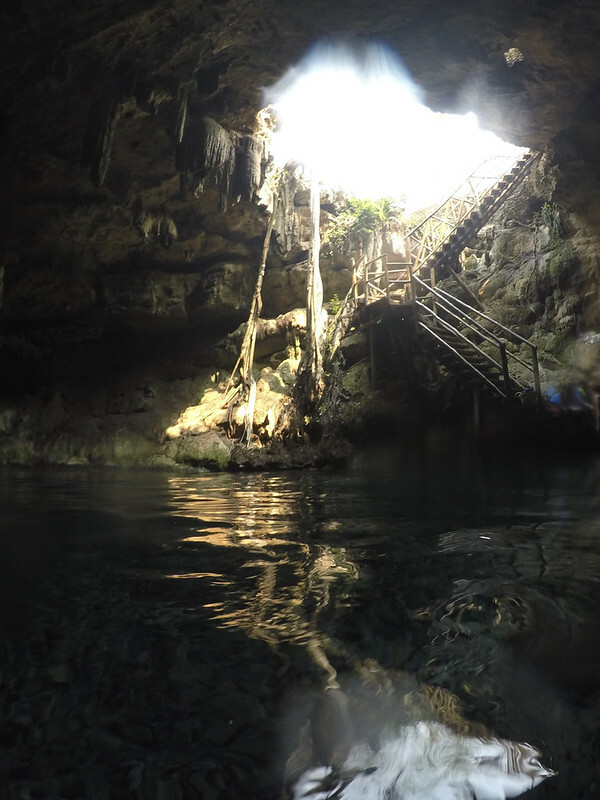 After the frustration of Compeche, we decided to blow off Merida and head to our first cenote! 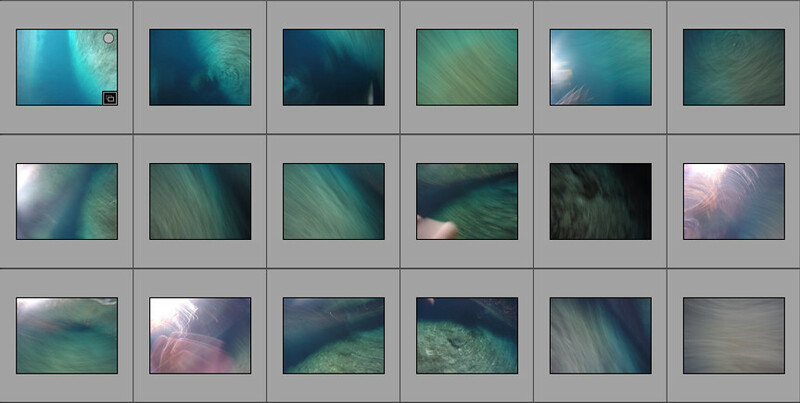 What is a cenote you might ask? A cenote is a natural pit, or sinkhole, resulting from the collapse of limestone bedrock that exposes groundwater underneath. Especially associated with the Yucatán Peninsula, cenotes were sometimes used by the ancient Maya for sacrificial offerings. Cenote water is often very clear, as the water comes from rain water filtering slowly through the ground, and therefore contains very little suspended particulate matter. There you go, I wikapedia’d it so you didn’t have to! After driving an hour on a dirt road we found the cenote site. It was a hot hot hot dirt parking lot with no facilities so we quickly realized we weren’t going to be camping there for the night. Despite Indigo’s initial excitement, the stairs leading into the big dark crater of water in the ground, scared him greatly. Then the water was too cold so he sat on the wooden platform asking when we were leaving every minute, for about 30 minutes. This was the first time I tried to use the GoPro, and we quickly I discovered I don’t know how on earth to use the GoPro! I would like to blame the poorly designed user interface for my troubles. Check out what Okan discovered on the card when downloading photos :). Looks like I need to read the manual. After our refreshing dip… we headed onward to Izamel, the yellow city. It was yellow all right! (Ochre-yellow to be exact) and I enjoyed walking around the streets and chuckling at just how far the yellow theme of the town goes. The man sitting in the doorway is even sitting on a yellow chair! 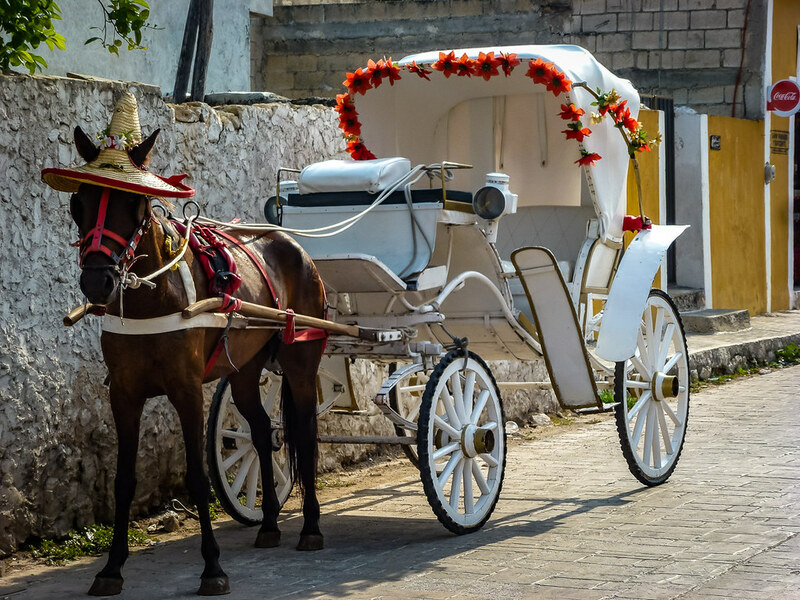 I also loved the horse and carriages adorned with flowers…surprisingly they were not all yellow. 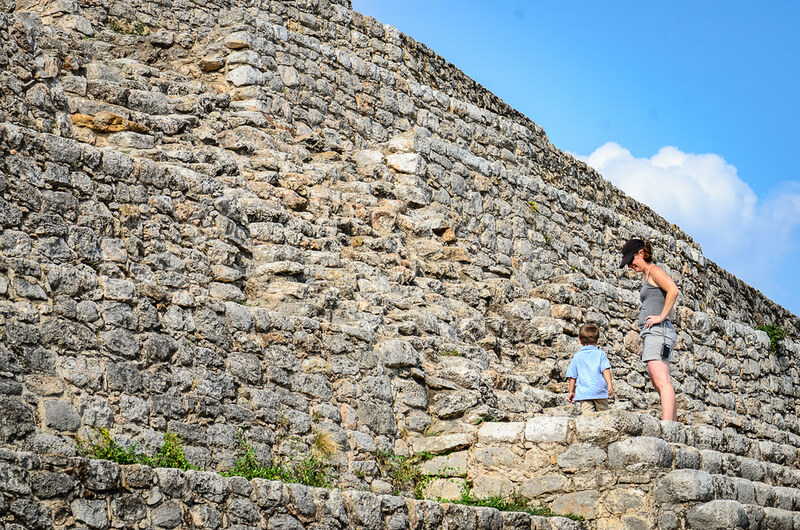 The Franciscan convent San Antonio de Padula (boasting the largest atrium in the Americas) is here and built upon the flattened top of the great Mayan pyramid that held the sanctuary of the god Itzam Na. The Mayans were here thousands of years before the first stone was laid on the convent, but the convent today is the more noted and visited feature of the town. 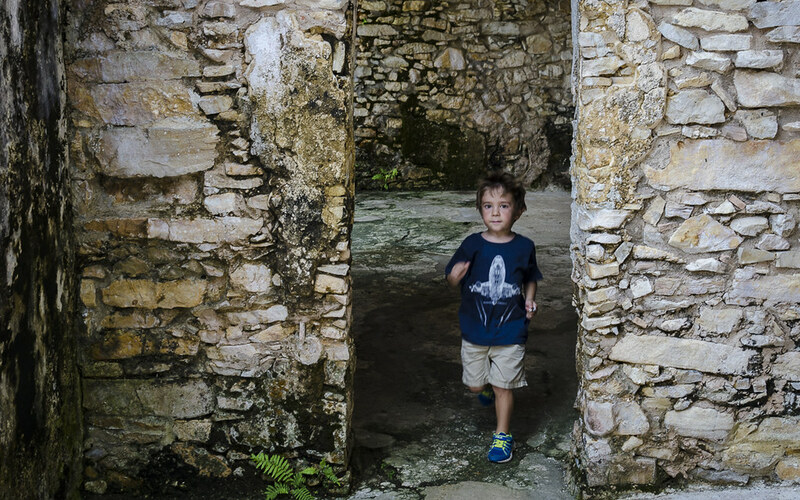 We were touring the town with Indigo in a bitty stroller we bought along the way for walking through towns, when we came to what is left of the Mayan ruins above ground. We (Okan) ended up carrying the stroller up the insanely steep rock steps, and vowed that we were done with strollers (again). 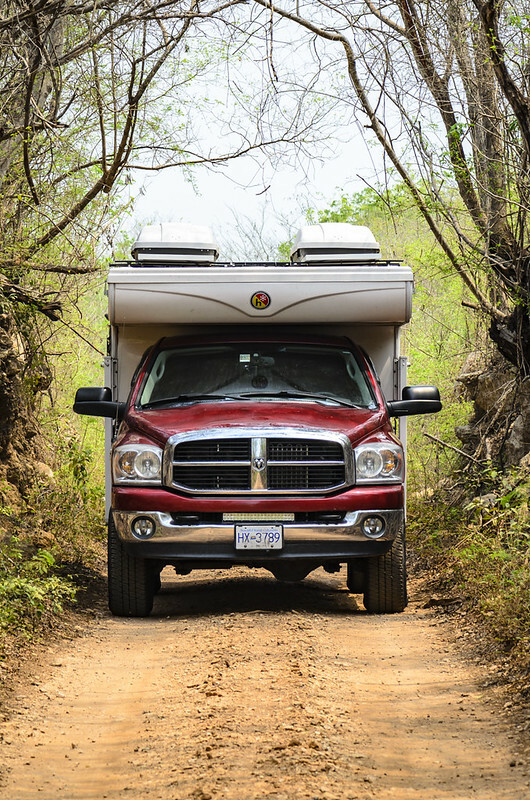 Lucky for us, the campsite at Izamal Camping & Hacienda Hotel had our best amenities of our trip to date, or maybe just after mosquitoey campgrounds, freezing cenotes, and tired out tourists. 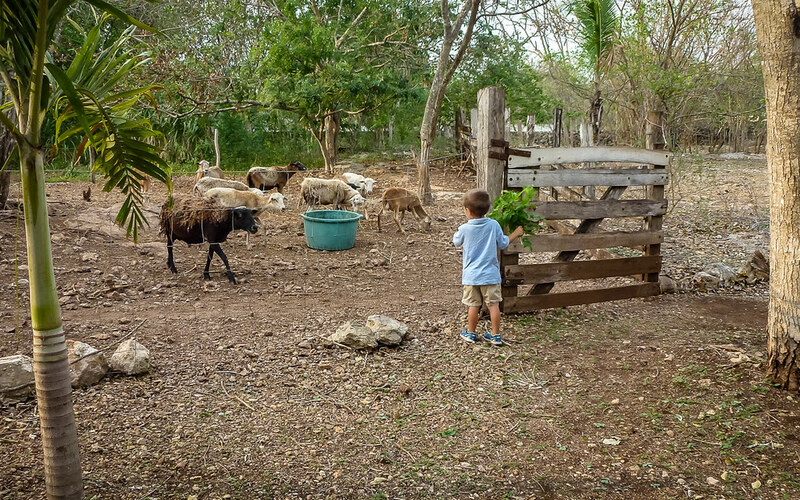 We had long hot showers, seclusion, serenity, and goats for Indigo to feed and play with every day. I never knew what a great feature goats could be at a campsite before! Indigo spent so much time with the goats that he would be gone for hours. He blended into the landscape quite nicely, and had he not kept his bright blue bucket with him, I might not have located him when it was time to head to the coast again.